A couple of years ago, while browsing in a Philadelphia bookstore, I found a small red hardback book. Its worn woven cover was used, but in decent condition. 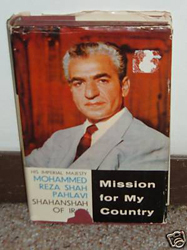 The side of the book, in a matching faded red background, had a small vaguely Islamic curved label that reads in gold lettering: Mission for my Country / His Imperial Majesty Mohammed Reza Shah Pahlavi Shahanshah of Iran. This was the Shah’s autobiography, published by Hutchinson & Co. in London, in 1960. I happily paid $10 for it and took it home. But I never read it. It was a curiosity more than anything. Plus, the color photo of the Shah on the title page, dressed in a light gray suit with a red tie, reminded me of one of my great uncles. His dark bushy eyebrows framed his eyes that stare squarely back off the page, while his black and gray hair still showed echoes of his youth at the age of 41. This new generation -- my generation -- of Iranians and Iranian-Americans that have grown up in the U.S. are now picking up this narrative and are taking it in a new direction." I love that in a single sentence, Pahlavi manages to evoke two lofty images at once — that he was a “Crown Prince,” and Switzerland, a safe, quiet Alpine country where international royalty stow away their cash and their children. But as silly as this episode may seem now, the Shah, as a Crown Prince, was helping to foment the beginnings of Iran’s reputation in Europe and North America: he was one of many Iranians who were initially educated in Europe — especially France and neighboring francophone Switzerland. The Shah himself is part of an unacknowledged groundwork of reputation that has been laid between the West and Iran. And it’s precisely for this reason that many Iranians and non-Iranians in America today are so compelled by what’s going on in Iran in a way that would be unlikely if such post-election turmoil was going on in another country in the region. We’ve been primed. Many people, particularly of the young wired generation like myself, are seeing viral Internet chatter, including a few Twitter messages from within the country (and more retweeting those messages), watching viral videos like the tragic death of Neda Soltan-Agha, and hanging on news of rallies spread over Facebook. But because we in the West have been primed for so long, similar stories online from another foreign country wouldn’t spark this same visceral, gut-wrenching interest in the same way. Who has been live-blogging, in English, the conflicts in Zimbabwe or Xinjiang for weeks on end, the way that Nico Pitney has been covering Iran? Iranians are a proud people and big talkers. Our favorite topic of conversation — like in many cultures — is about how great everything in Iran is, and more importantly, has been for centuries. How succulent the pomegranates are, how crackly the pistachios are, how lyrical the poetry is. Most Americans at least know a few Persian historical and cultural touchstones, like Cyrus the Great and Persian carpets. So now that Iran is trying to sort out the next phase in its political history, many of us Americans are rooting for reformist icon Mir Hossein Mousavi — he’s not Ahmadinejad, right? — without knowing much about him. 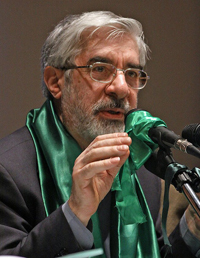 Mousavi himself has been thrust into the media spotlight in Iran and abroad, and almost overnight, many Americans and Europeans are plastering his green campaign color on all over the Internet and on political posters. In other words, because of this priming, we in the West — Iranians, Iranian-Americans, and even non-Iranians — all now want to be part of it, touch it somehow, or say, yeah, we always knew that this green revolution was possible. During the Shah era, many upper-class Iranians were educated abroad but then returned to Iran to work in the burgeoning industry. This included people like my father, who studied architecture in the United Kingdom in the late 1960s. They too helped to create this idea in the minds of many Westerners that Iranians were part of a deep and rich culture, well on their way to learning about Newtonian science, Weberian work ethic, and Wilsonian scholarship. As more and more Iranians emigrated, many everyday Americans in big cities and small towns found themselves interacting with Iranian dentists, doctors, lawyers, and other white-collar professionals. Professional organizations like the Society of Iranian Architects and Engineers and the Iranian-American Bar Association have sprung up with increasing frequency in the last few decades. Within the last decade, Iranians in the United States have organized politically for the first time, with the creation of the National Iranian American Council, led by an Iranian raised in Sweden. In 2007, Beverly Hills’ Jamshid ‘Jimmy’ Delshad became the first Iranian-born mayor elected in the United States. But it’s not just the role of professionals and politicians that have shown Americans how smart and proud Iranians can be. Within the last decade, there has been a wave of English-language memoirs written by Iranians and Iranian-Americans, beginning with Tara Bahrampour’s “To See and See Again,” (1999), and continuing with Terence Ward’s “Searching for Hassan: An American Family’s Journey Home to Iran” (2002), Firoozeh Dumas’ “Funny in Farsi” (2003), Marjane Satrapi’s “Persepolis,” (2004), Afshin Molavi’s “Soul of Iran,” (2005), Azadeh Moaveni’s “Lipstick Jihad,” (2006), Hooman Majd’s “The Ayatollah Begs to Differ,” (2008) and many others. This new generation — my generation — of Iranians and Iranian-Americans that have grown up in the U.S. are now picking up this narrative and are taking it in a new direction. We’re more fluent with mobile phones and the Internet, and we’re curious about new Persian-language tools being created for Iranians like Balatarin (a clone of Digg.com). There are many Iranian-Americans who, like me, didn’t really have a strong Iranian connection growing up, but are now part of this hybrid search for heritage that Iranian-Americans and non-Iranians want to witness and participate in. Heck, I’ve worn my Iran soccer jersey for the first time in months. Of course, it’s easier for me to latch on to the election, as I also hold an Iranian passport and have extended family in Iran. But it’s been that much more surprising and impressive that many of the loudest and most active voices in the U.S. supporting Iran are not even Iranian at all, and have no previous connection to Iran. 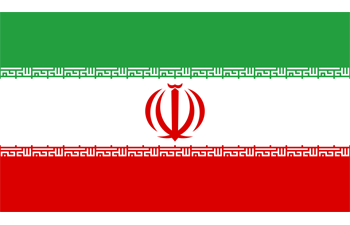 This month, Heap announced the creation of Haystack, a new anti-filtering tool designed specifically for Iran. He’s currently testing with a “handful” of users in Iran and hopes to distribute it more widely for release in the coming weeks. Heap’s youth and passion echo that of Howard Baskerville, a Princeton-educated Nebraskan who moved to live and teach in Tabriz, Iran in 1907. 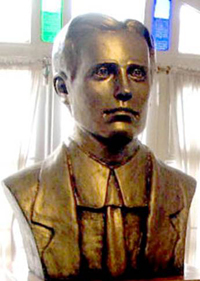 While living in Tabriz, Baskerville got caught up in Iran’s Constitutional Revolution of 1908 and led a group of 150 nationalists who were fighting Iran’s Qajar monarchy in April 1909. He succumbed to a gunshot wound he suffered in battle on April 19, 1909, passing away at the age of 24. Similarly, many modern Americans who previously had no connection to Iran are suddenly thrown into this storied culture and want to participate in a meaningful way. That’s why we’ve seen so many people turn their Twitter avatar color to green, set up Internet proxies for Iranians, or plaster the Where is my vote?” slogan all over the Internet. We’ve heard the history, the stories, and we get it.